Batteries not included - Nearly. 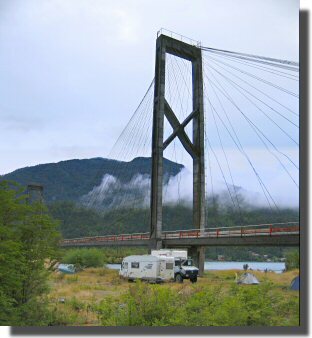 The 170kms of dirt road we covered today was about average for the Carretera Austral . There were some relatively smooth sections of road, but most of it was corrugated. Unless you have driven on corrugated roads, it is hard to appreciate just how punishing they can be. The corrugations on this road are about 100mm high and between 500mm and 1500mm peak to peak. This means that if you drive at 40kph your vehicle shakes up and down between seven and twenty times a second! Ordinary European campervans are not designed to withstand this sort of treatment hour after hour. Remarkably they do survive, but the constant vibration takes its toll. Cupboards fall off walls, ovens and fridges fall out, water pipes disconnect etc. etc. Today the GRP box that held Mel's leisure batteries disintegrated! The red arrow (below, left) points to one of the batteries hanging down about 200mm below its proper position. The black flap under the battery is the detached bottom of the battery box. By a great stroke of luck this happened just as we were parking for the night. Although the bottom of the box was no longer supporting the batteries the top of one battery had jammed on the bottom edge of the box. One or two more bumps and at least one battery would have hit the road, then the fuel tank, then the back wheel! 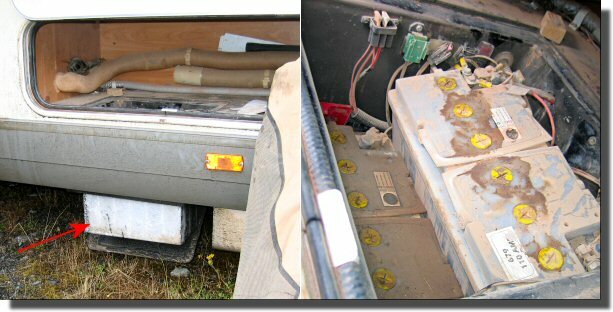 Having disconnected and removed both batteries it was soon clear that the battery box was so weak as to be irreparable with materials we had at hand. The problem now was how to support two batteries weighing 30kg each. 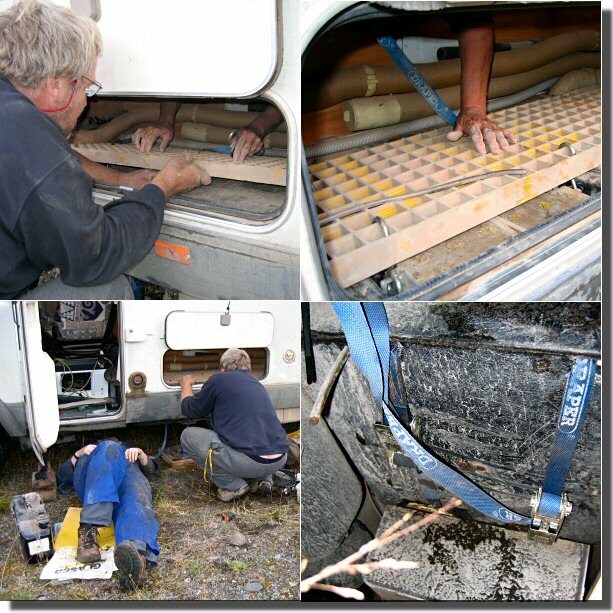 The final solution was to use one of Mog's GRP sand mats to bridge the top of the battery box and support two ratchet straps under the bottom of the battery box. Not elegant, but it is working. Home - This page last changed on 2007-02-10.